The House on Ancaster Creek is an example of owner-driven development, creating a unique solution to the complex issue of aging-in-place. 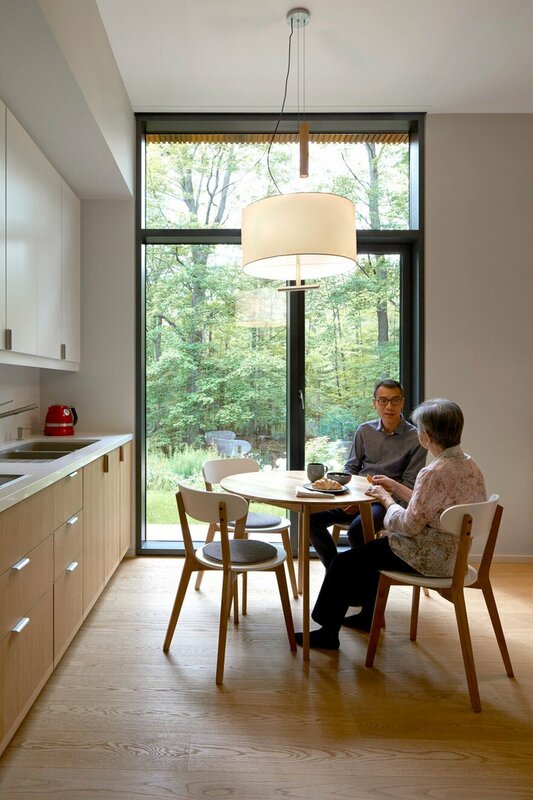 The project constructs a scenario for living that allows for autonomy while mutually benefitting from proximity. It confirms that sustainable systems and designing for the elderly are not exclusive from modern expression and exquisite details. As the family changes so can the family home. A wide lot backing onto Ancaster Creek is the site for a intergenerational home for a family and their elderly parents. 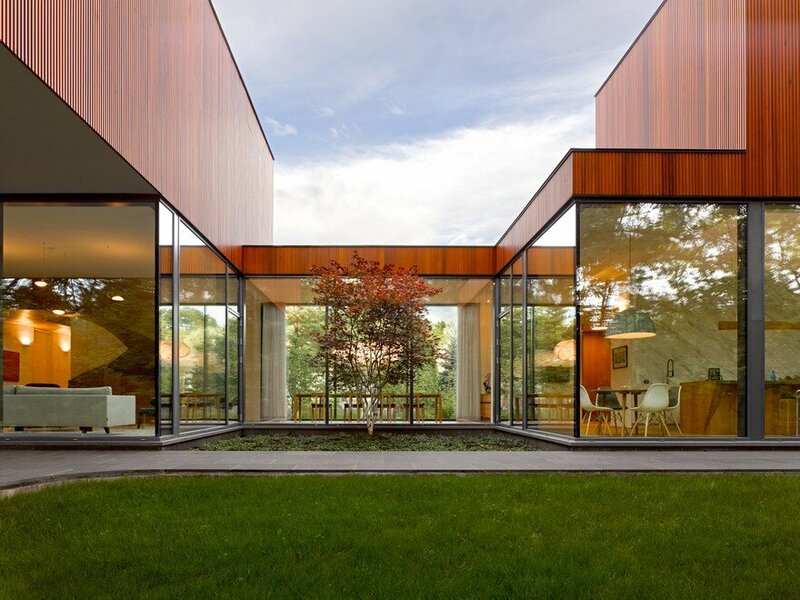 The house was conceived as two distinct residences, each formed into a linear bar containing the full program of a home. The bars sit perpendicular to each other, creating a landscaped courtyard setback from the street, and stack at the corner. Ancaster Creek and its associated floodplain traverse the property. This site is one of 596 private properties that accommodate forest, wetland, meadow, and aquatic habitat in this protected area. 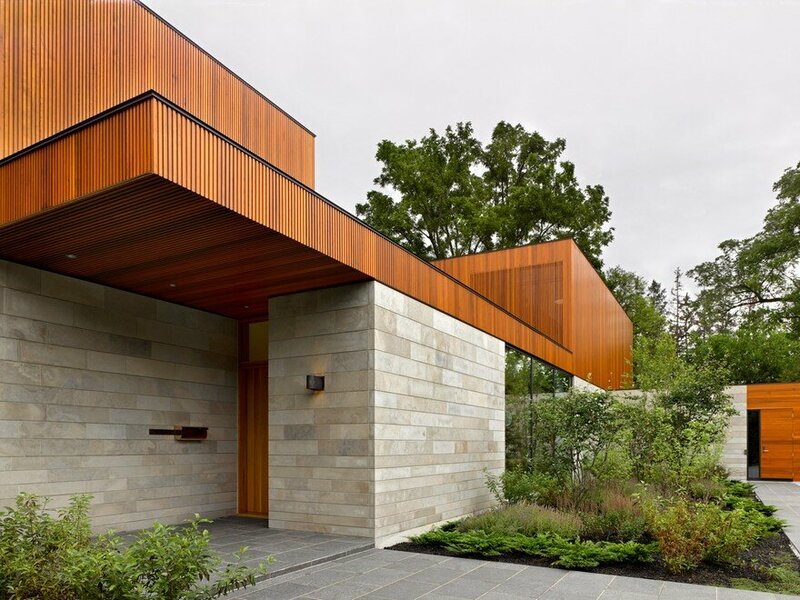 The house is located at the back of the property in close proximity to the creek, while respecting the meander line to avoid the floodplain and erosion hazards of the watercourse. 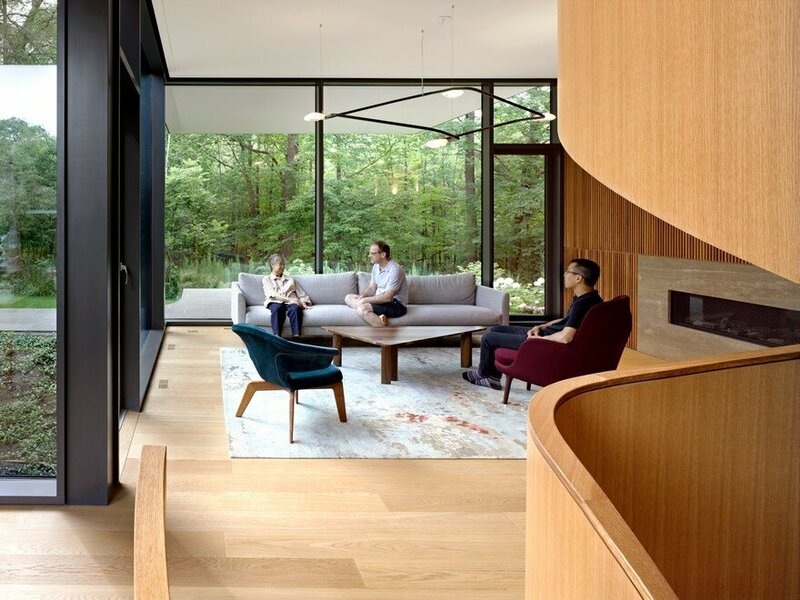 The landscape moves through the house, creating a natural context and denying the collection of McMansions that have been developed around the site and attempt to contextualize it as suburban instead of as connected to the land. The parent’s suite occupies the ground floor with the living and dining space anchoring the view. 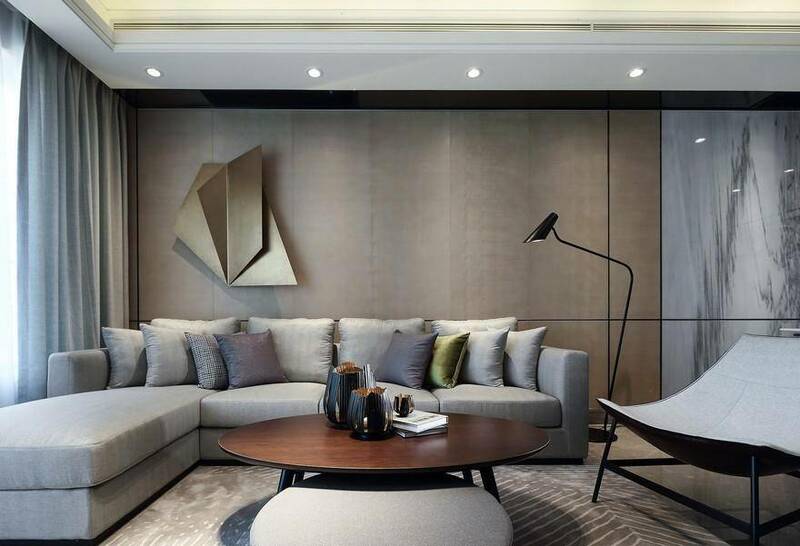 The suite is laid out as a single floor accessible apartment with added features to accommodate the specific challenges facing the ageing parents. Among them, well-located drains and a master power switch mitigate issues that have come with memory loss: a sink left running, or an oven left on. A second bedroom and bathroom are adjacent, but separate, for a live-in relative or nurse. Running parallel to the creek is the main residence. The kitchen anchors the south end of the house. 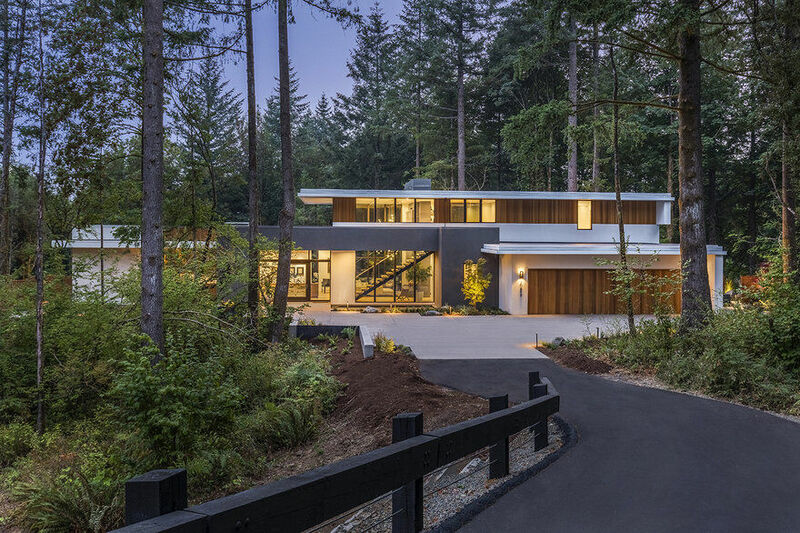 Set in a double height volume, the 20-foot-tall pyramidal ceiling creates an expansive space that opens to the creek, the courtyard, and above to the sky. 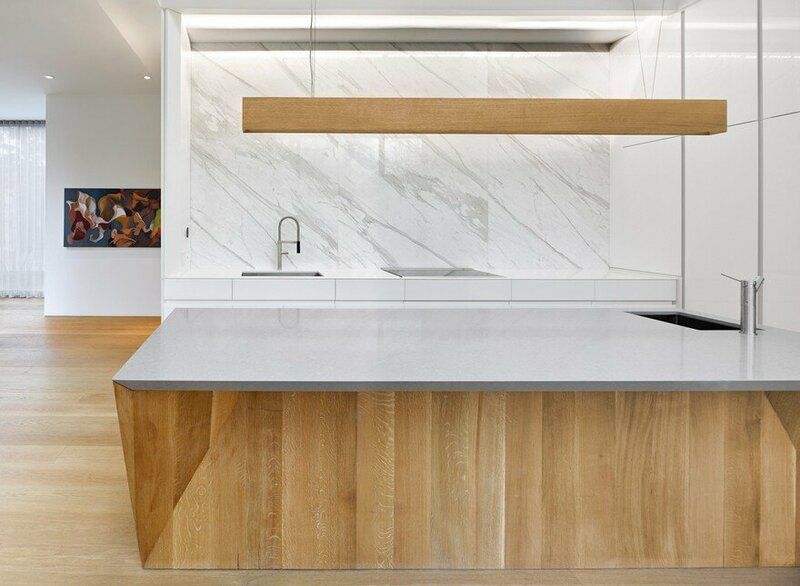 Backpainted glass and polished Calacatta slabs are meticulously detailed to reflect the surrounding landscape and contrast the heavy, flat-sawn solid oak island with a faceted base. 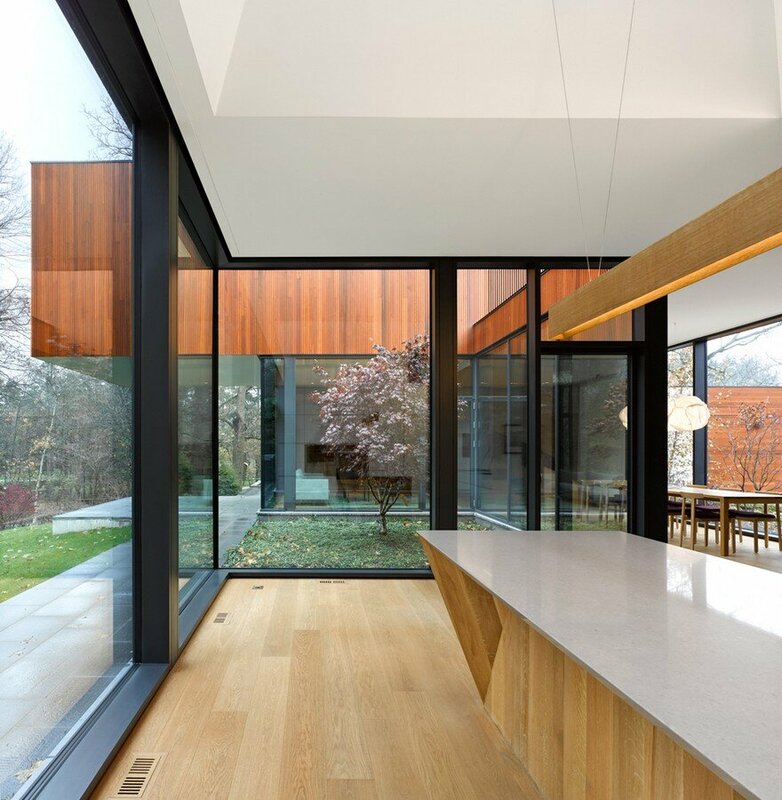 The dining room occupies a glazed link pinched between the landscape that flows from the creek, through the courtyard, and to the front of the house. The living room, with a honed travertine fireplace and oak wall rendered in the form of the exterior cladding, extends under the cantilever in the summer months, doubling in size. These social spaces are shared by the extended family. A connected hallway that is easy to navigate for the parents leads around a softened corner and draws the family together. 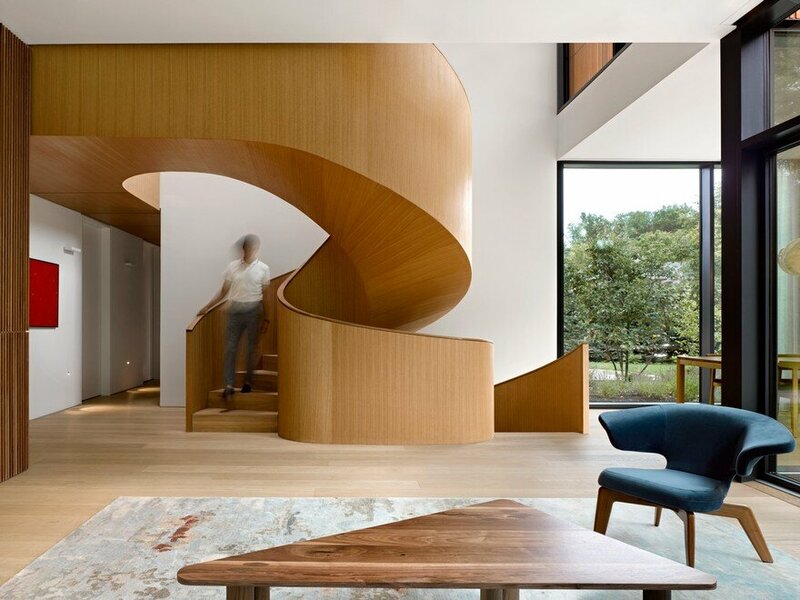 The grand gesture of a wood-clad spiral staircase connects the living room to the second floor master suite, creating a unique moment in the otherwise orthogonal room and celebrating the connection between floors. The curvature opens as it rises and becomes the ceiling of the adjacent wing, creating a pinwheeling effect that leads to the parents’ suite. 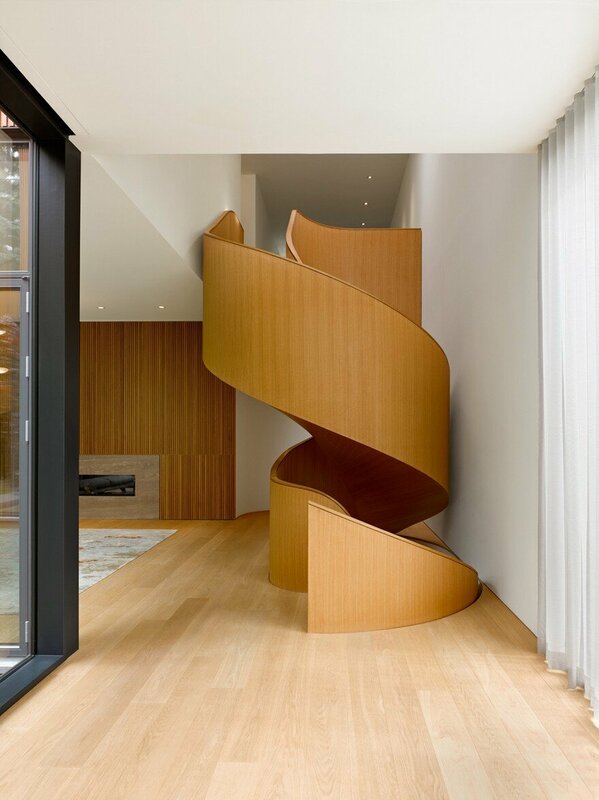 Structured with sheets of laminated plywood, the white oak railings become thin, curved, structural elements that bridge between the floors. The complexity of this system is seen in the connections between the layers, with the two sides tied together by the treads, effectively treating the tight, inner spiral as a post. 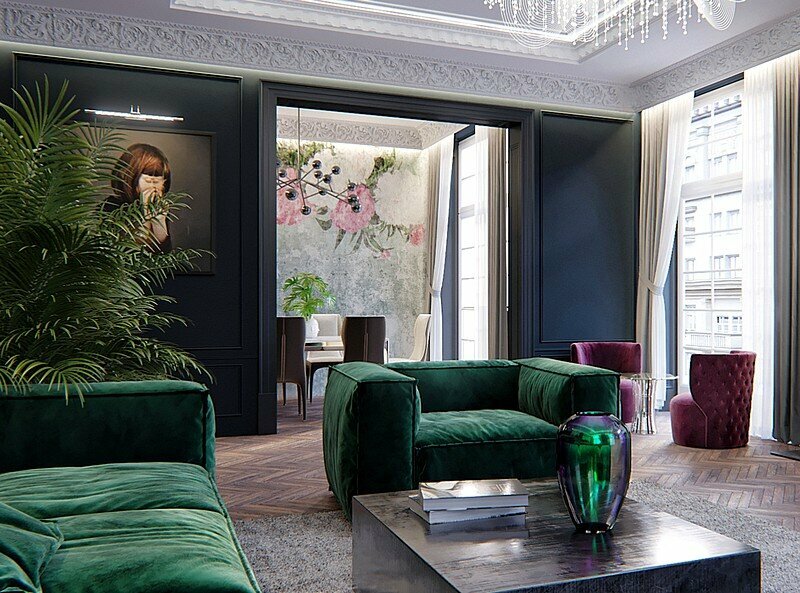 The small second floor acts as a private suite. 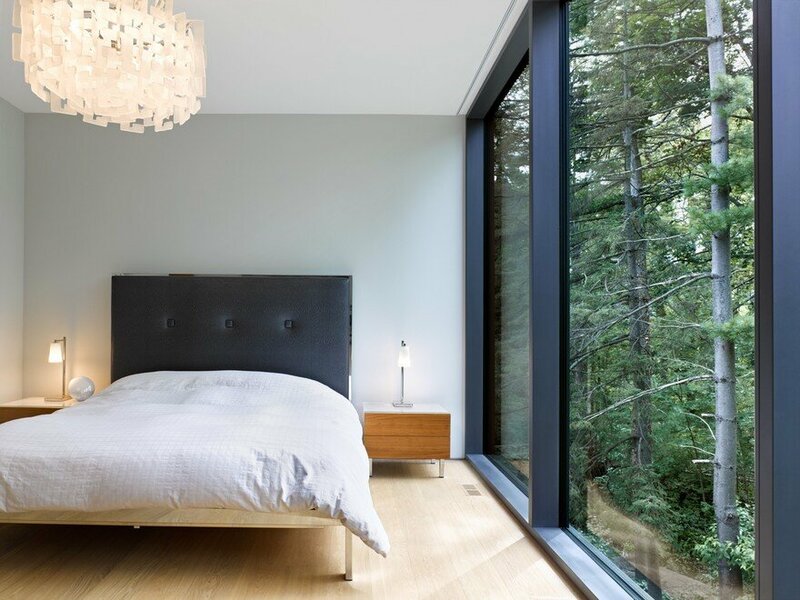 A lounge with concealed bar extends from the large landing, a custom oak library painted a soft blue provides an office space, a light-filled cantilevered bedroom reaches out into the best views of the creek and a serene bathroom clad in grey marble tiles sits across a linear walk-in closet. With sustainability at the forefront of the design process, the requirement of material durability and longevity was paramount. Careful detailing of local materials achieves this. 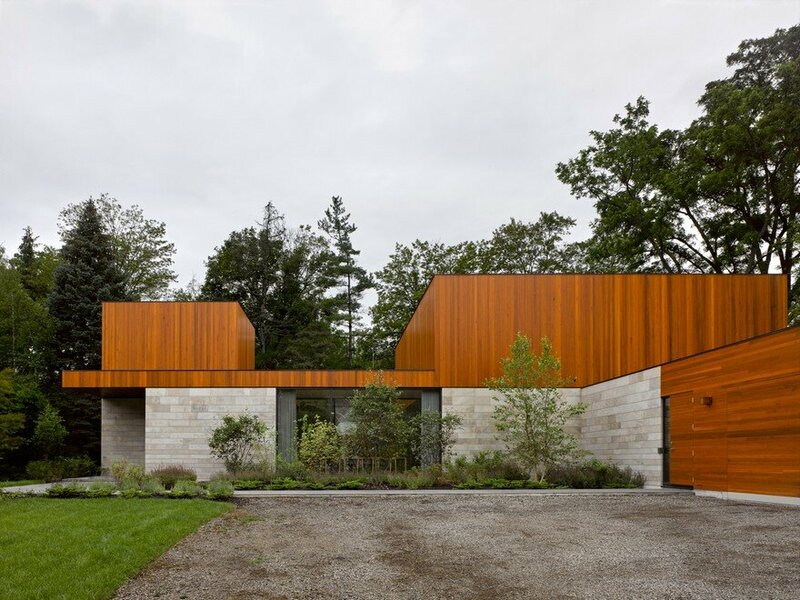 The ground floor of the house is clad in 3-1/2” thick locally quarried Algonquin limestone which meanders around the perimeter. The coursing is designed to highlight the compression and layering that forms this sedimentary rock. 12” tall stones at the top-most course compress to 4” at the bottom. The horizontal joints are raked deep and the vertical joints are filled flush to emphasize the horizontality of the rock. 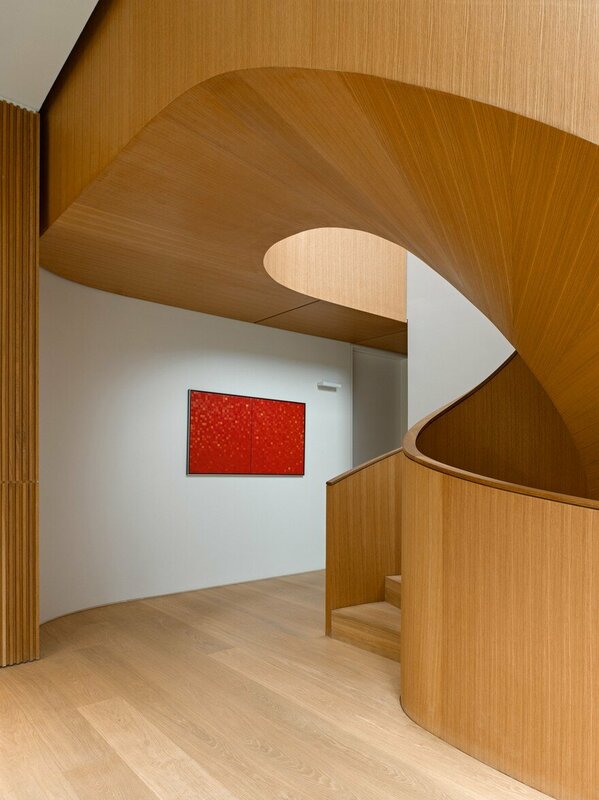 Milled cedar clads the upper volumes of the house. 1×6 boards were milled with thin shadow lines that create depth in the material and emphasize the verticality of wood’s natural state. A three part finishing system extends the life of the wood and stretches the time required between maintenance work. 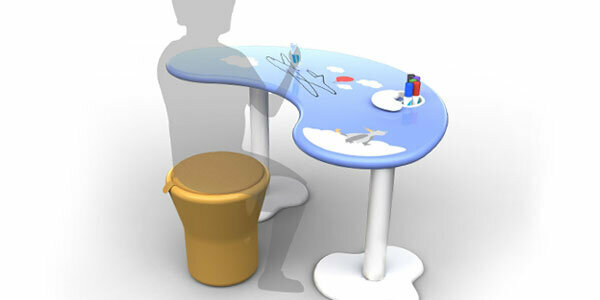 To reduce the ecological footprint, energy consumption was decreased through a number of key moves. Most importantly, two families are now living on a single-family lot, increasing density without increasing building area. Second is the envelope: A high-performance glazing system, triple-pane wood-frame windows with an average Uw = .77 anchor the highly insulated envelope. Radiant floor heating can then be used sparingly and only to compliment a high efficiency furnace. Finally, a 37 module 9.8 kW Canadian made solar array was installed across two of the flat roofs, offsetting energy consumption. 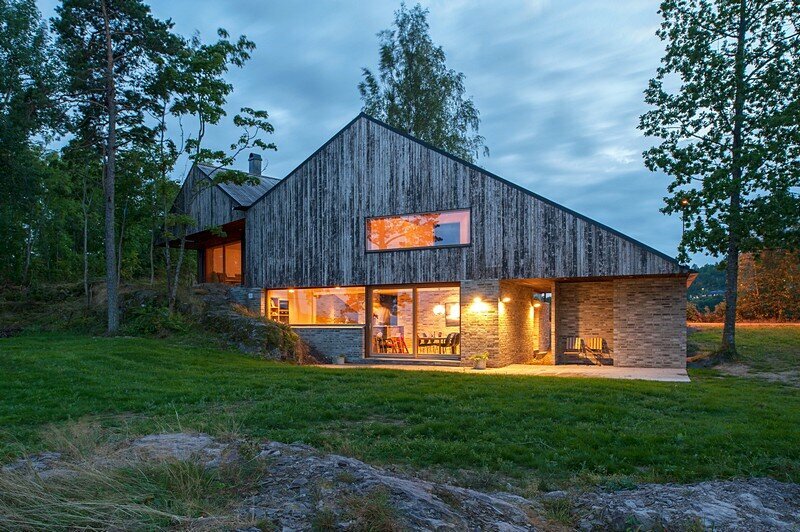 Combined with LED lighting, these measures culminate in a low-energy home that sits comfortably in this Northern climate.